"It is a woman's fate to suffer...simply to endure is to triumph." In Patricia McCormick's Sold, Lakshmi knows how to take pleasure in the simple things in life. Her pet goat, Tali. The way the sun rises over the mountains surrounding the village. The tinkle of gold in her mother's ears. Even though her stepfather spends his days at the teahouse gambling rather than working. Even though the old thatch on their roof lets in as much rain as it keeps out. But after a terrible drought, followed by terrible rains, the family is left with nothing but debts. Nothing, that is, except Lakshmi. Lakshmi's best friend Gita left the village to be a maid to a wealthy household in the city. Lakshmi sees the tin roof that her friend's natal house now has. She sees the 'electric sun' hanging from a cord inside. She sees the weariness of her mother, and her tiny baby brother. So when the crops fail and even her mother's earrings are sold, Lakshmi can easily see what a great help it would be for her to go to work. And with a heavy heart, but a hopeful gaze, Lakshmi leaves with the beautiful stranger, and her stepfathers leaves with a handful of money. As Lakshmi travels to the city, she sees many things she's never seen before. She sees the landscape race by her as she rides the train. She sees men in uniform, and is frightened of them. She sees a girl, in the gutter, with her head freshly shaven and with men throwing cigarette butts at her. She sees what happens to women her age who disobey the men in their lives. Even after all these sights, Lakshmi still arrives in Calcutta with the hope that she'll be a help to her family. She walks into Happiness House with a straight back, hoping to show her new bosses that she is a hard worker. She sees girls in beautiful dresses, and she starts to wonder if working in this place might not be so bad after all. Then Mumtaz gives Lakshmi her first 'job,' putting her in a room with a man who had paid for her. Written in free verse, Patricia McCormick does an amazing job transporting the reader to Central Asia, contrasting the remote, idyllic village in Nepal where Lakshmi was born and raised to the dirty, bustling city of Calcutta. Written in free verse, the chapters flow together with the reader not realizing how quickly the story is passing until the final climactic pages. 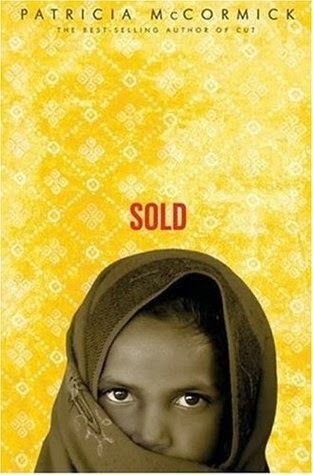 Painstakingly researched, Sold is a beautifully written young adult book that keeps its readers in mind regarding content, and is a wonderful introduction for young people to the realities that girls face other parts of the world. Highs: The wonderful stories of contentment taking place in the village give a sharp contrast to the bleakness of life at the Happiness House. Lows: Being a young adult book, it wraps up just a bit too neatly for my adult taste, but that's expected in the genre. Verdict: A great book for a classroom, or a cross-generational reading group, with beautiful prose and a tactful manner of handling difficult subject matters. Manga Monday: What in heaven is the monstrosity on the cover? Our intrepid Survey Corps members encounter what are by the most abnormal Titans yet in Attack on Titan Volume 9. 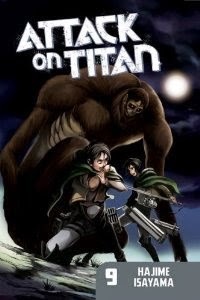 Note: Attack on Titan Volume 9 is part of an ongoing series. Check out the review for Volume 1 here, and Volume 8 here. Otherwise, read on!